Remember the clean room contest? I finally gave the winner, Kade, his award. 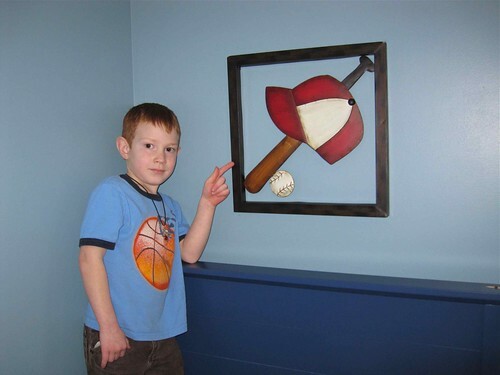 When I asked him how he wanted his room painted he said "baseball". I was not up to making his room look like a baseball field, although that would have been cool. I took a simpler route. It took me a couple of hours but the work went by rather quickly. Right before he got home from school I was rushing to put everything back the way he had it. I then closed his door and made him close his eyes before going in. (per Kate's request) Here's a little video of his reaction. As you can see he liked it. I think it turned out great. Love the color. The things he was asking about were some wall hangings I found at Hobby Lobby. I put the camera away and grabbed a few tools and then Kade helped me hang them. Here's one of them. Now I've got to finish his curtains. I had them ready to hem but the lining was too stiff I couldn't even get the curtains on the rod. So I have to rip them all apart. Love that. I plan to make a valance out of pennants. I bought some felt for that. If it turns out the way it looks in my head it will be great. Hey Janel, how about just buying a plane ticket and then you can see the whole thing in person? I love all those home improvement shows with the big reveal. I'll have to remember to do it for the girls' rooms too. I just wish I could have had everything done before he came home from school. Oh well. Janel, I'll show you mine if you show me yours.